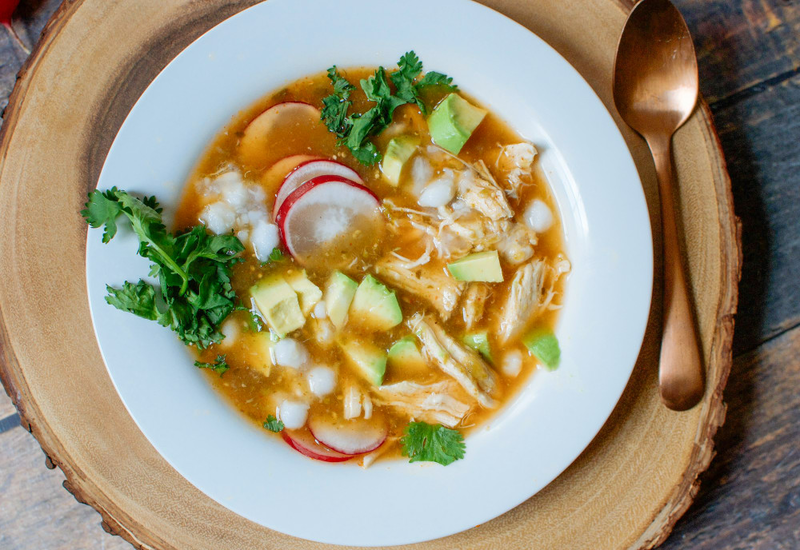 This classic Mexican soup is perfect for cold weather days and busy weeknights—it cooks in just 20 minutes! Though posole is often made with pulled pork, this lighter version uses pre-cooked, shredded chicken simmered in a green chili broth. Creamy hominy (dried corn kernels) adds body to the chicken stock, lightly spiced with cumin, onions, peppers and garlic. This comforting soup recipe is a great meal to feed a crowd, and is sure to be a hit with both kids and adults. Top it all off with thinly sliced radishes, avocado and sprigs of cilantro. Feel free to mix and match toppings. Try fried tortilla strips or chips, chopped white onion or a sprinkle of cotija or grated mild cheddar cheese. You could also stir in a can of black beans for fiber, or 2 cups of frozen or fresh corn kernels. Per Serving: 253 calories; 14g fat; 14.6g carbohydrates; 18g protein; 53mg cholesterol; 447mg sodium. This is my favorite chicken posole recipe. I love all of the classic ingredients like rashes, lime, and cilantro. This was such a quick recipe, too, which is always a plus. This is perfect with cotija cheese crumbled on top as well. I made this classic chicken posole soup and it was really quick and easy to make. The radishes and hominy gives it a great crunch, the chicken was super tender, and the overall flavor was delicious. This is now one of my favorite chicken soup recipes! I made this recipe using pork shoulder instead of chicken. I also added jalapeños and serrano peppers for more heat. Next time I want to try making this recipe in my pressure cooker. It was delicious! I decided to use pulled pork (even though it's not the lighter version). I loved the creamy hominy! I added extra cumin and garlic, and it really made the flavor boom. This is my idea of a comfort food soup!